Hurting Hearts and Helping Hands helps children learn about Haiti before and after the devastating earthquake in January 2010. Children hear stories and learn songs from Haiti, make mud cookies, take an imaginary boat trip and play games, while connecting Christ's command to help and serve others. This cycle includes a wealth of links to resources, a list of fundraising ideas and Haitian recipes to help you plan a Haitian feast and involve the whole congregation. 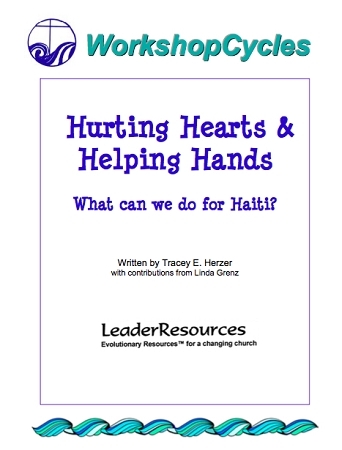 An expanded list of recipes and fundraising ideas and more lessons are included in "Hope for Haiti" -- a resource packet designed to help congregations raise funds to rebuild the Holy Trinity Cathedral complex or other nonprofit of your choice. Appropriate for K-5th Grade.